and we will be moving on to Fall. If not, try at least once! You'll laugh...I can promise you that! What fun things have you tried in this season? 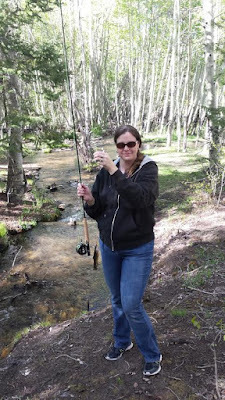 I have tried stream fishing. I was surprised at how fun it was. You move quick... no patience needed for it. Within the first 3 minutes, I caught 3 fish! Go for a walk, explore!! Take a day trip somewhere you've never been. Go for a drive with your family! Getting stuck in the mud is what it's all about!! Lot's of winching, lots of mud!! Be present!! Be in the now!! Yes, you are so right, just blink and summer will be gone! Love this picture so much!! Love the fact you make an effort to enjoy each day with your loved ones! Happy Summer and Happy Day to you! Great advice. All too often we get stuck in our own head and cannot get unstuck. All those things you mention are way to get unstuck. thanks for the list. gonna go set on the porch before the day has ended. 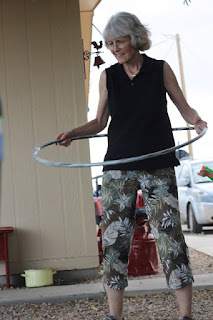 I love having fun and I always plan to be young at heart...even when I'm 90...lol! I have never been able to keep a hula hoop up for very long but maybe by the time I reach 90, I will have mastered it! HA!! Hello! Looks like you've been having lots of fun lately! I agree, that we all need to have fun. I try to teach my kids that work even can be fun...you can find something enjoyable in just about anything. It is great to try new things, and go new places...just to add some spice to life. I hope you have a splendid day!!! One thing I'm learning from cancer is to ENJOY LIFE NOW!